There’s plenty to love about the Hoover Linx Cordless Stick Vacuum cleaner, and if you are searching for a cleaner that does more than you expect, there is none better out there. After careful research, this stick vacuum cleaner has proven it has what it takes to earn honors as one of the best of its kind. Hoover is a name that has been around for generations and it is clear to see why they are considered one of the best vacuum cleaner brands out there when you own the Linx. Hoover Linx Cordless Stick Vacuum Cleaner is the cleaner picker-upper cordless vacuum cleaner dreams are made of. It’s so easy to use and store; bottom line, it gets the job done! There are plenty of people who wouldn’t use any other vacuum cleaner. These people love the many features offered with the Hoover Linx, as well as its affordable price and great cleaning power. A 4.5 out of 5 stars is a good rating to have, and the exact number Amazon customers have given to the Hoover Linx Cordless Stick vacuum cleaner. A near-perfect cleaner is what you have on your hands. One of the most important features of a vacuum cleaner is its ability to clean. The Linx vacuum cleaner works wonders on both small and large areas, whether it is time to spot-clean a spilled drink or the entire floor is ready for a vacuuming. The suction is powerful, and certainly far more than what you would find in the average vacuum cleaner. No matter what it is you need to clean the Hoover Linx will ensure there is nothing left but a clean floor. Hoover offers WindTunnel technology with this cordless vac. This technology ensures that the suction is always at its best no matter what you are cleaning. The small design of the vacuum cleaner helps reach all of those spots other vacuum cleaners miss. It is also lightweight, coming in at only 7.5 pounds. It is so lightweight even a child can carry the vacuum around with them ! And, the vacuum can be used on dry and wet surfaces as well as carpets and hard floors. It is lightweight and compact, making it a vacuum cleaner that can easily go with you wherever you may go. A Fade-Free Linx Lithium-Ion Battery System lasts long enough to clean the entire home. It takes only four hours to completely charge the vacuum cleaner. When it is time to recharge the vacuum cleaner a fuel gage lets you know to power up. Not all vacuum cleaners offer such a feature, and it is a nice one! The 18-volt battery comes with a charger and a two-year warranty so you are protected should something go wrong within this time period. 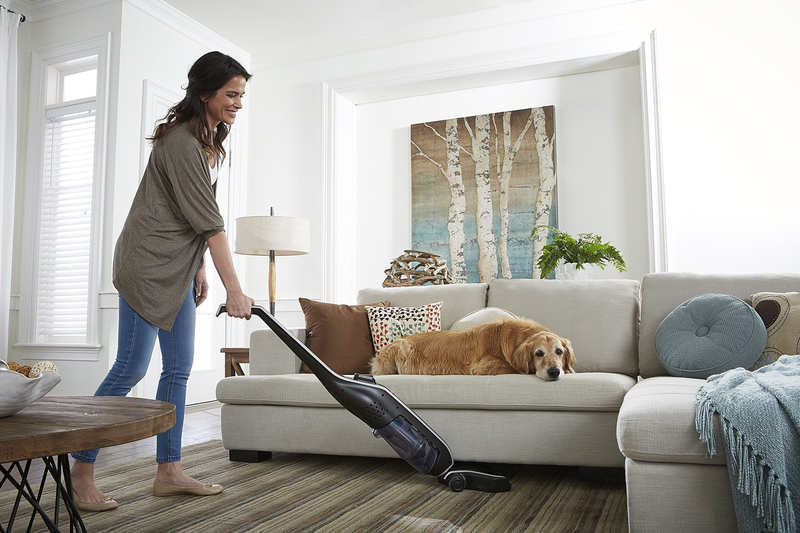 Lightweight and powerful, the benefits of the Hoover Linx does not stop there. If you’ve ever had a vacuum cleaner with a bag that needed to be changed you certainly know what a mess this can create. With the Hoover Linx Cordless vacuum cleaner a easy-to-change cup can be removed and replaced in just seconds, ensuring that dirt hits the trash can and not your floor or your face. The clear design of the canister enables you to easily tell when it is time to empty. The Brushroll features an on and off switch that makes it fast and convenient to change what you are cleaning in seconds. And, with edge clean bristles you can be sure that even the dirt around the edges of the wall is gone after using. The low-profile base makes it easy to reach even the tightest of spots. Need to get in between the couch and the sofa? The Hoover Linx allows you to do so with ease! Since there is no cord you can easily clean and go without winding up a cord or having to find a power source. The 11-inch wide nozzle offers a wide-mouth opening, and automatic height adjustment makes it easy for anyone, no matter how tall (or short) they may be, to clean and use the vacuum with ease. A feature that is absolutely superb is the vacuum cleaner’s ability to stand upright on its own. There is no need to find a wall to lean this vacuum against! It also makes it much easier to store when it is time to put the Hoover Linx away. At 11x8x42, this cleaner is small enough to fit most anywhere easily. Comfort grip handles are a true enjoyment. Some vacuum cleaners can hurt your hands and tire you from cleaning quickly. The handles on the Hoover Linx are soft and comfortable. In fact, you may not want to put the vacuum away! How Much Does The Hoover Linx Cordless Vacuum Cost? The Hoover Linx Cordless vacuum is available at an affordable price for any budget. With a two-year warranty you have even more confidence in the purchase and money that you will spend on the cleaner. Should the vacuum or battery/charger fail you during this time a replacement vacuum cleaner or refund is available to you. When a vacuum comes with a warranty such as this you can always count on getting a product that will always live up to your expectations. When you purchase the Hoover Linx Cordless vacuum you get the vacuum itself, of course, as well as a battery and a charger. Where Can I Buy The Hoover Linx Cordless Stick Vacuum Cleaner? Buying the Hoover Linx is easy when you click here. Your click will take you right to the Amazon website to make your purchase. Amazon really is the best place to buy the vacuum cleaner as they offer the best price you’ll find anywhere. Where Can I Read Hoover Linx Reviews? Sometimes an honest review is hard to find. Amazon has real reviews from real people, those that have used the Hoover Linx Cordless Stick in the past and want to share what they’ve learned with you. Take advantage of learning the truth, the whole truth and nothing but the truth by clicking here to read the Amazon reviews. In the meantime, check out just a few of the reviews posted on Amazon.